ACHS JUNIOR WRESTLER Barrett Bonnett is surrounded by Albia cheerleaders as he holds his 100th career victory banner at Thursday’s Senior Night event. From left, Makayla Hamilton, Savannah Stalzer, Allison Hugen, Barrett Bonnett, Abby Fee, Emily Duncan. Dawson Bonnett fights off a single leg takedown attempt by his Davis County opponent. He lost in a 3-2 decision. JUNIOR 195 POUNDER Doug Flattery nears a pin in his match against Central Decatur’s Lane Moore. Flattery scored the pin in 3:49. Coach Dave Wenger will be making decisions this week of whether to wrestle Jer McAninch at 220 or 195 and Flattery at 195 or 182 for sectionals. JER McANINCH circles his Pleasantville opponent in an upset 3-0 loss at 195. McAninch rebounded with a pin over his Davis County opponent in 3:01 and earned a forfeit in the Central Decatur meet. Four Albia seniors were honored in the wrestling team’s last dual of the season and it was bitter sweet. The team lost two of three dual meets to finish with a very solid 14-5 record. And Barrett Bonnett, only a junior, earned his 100th career victory with a pin over Austin Payne of Davis County in 45 seconds. “To say that it was an unusual week would be a huge understatement,” said Coach Dave Wenger. “For the second Saturday in row, not only were we unable to compete in a tournament due to weather (Solon Jan. 12 and I-35 Jan. 19) but the weather kept us from wrestling at Sigourney on Jan. 15 in dual competition as well. That is three lost opportunities to wrestle in roughly one week and it’s highly doubtful that we will be able to make any of those up since it is so late in the season. “To top things off, we lost a few guys in our lineup due to various other reasons, so it’s been an incredibly challenging January,” he said. “As we move forward, it will be important to turn the page and focus on the things that we have ahead of us. We can’t do a thing about the things that have happened, but we can have a say in what lies ahead. Those seniors included Aden Reeves, Tate Padilla, Jer McAninch and Jaquon Stallworth. Albia lost to Pleasantville 42-27, to Davis County 40-30 and beat Central Decatur 66-18. In the losses, it came down to forfeits at 126 (Reeves knee), 182 (Padilla broken ankle) and 285 (Stallworth undisclosed). Jer McAninch dropped from 220 to 195 and lost a tough match to Daniel Kenyon of Pleasantville 3-0. At 220 Montez Ellis lost by pin in 2:39 and Albia forfeited 285. Carter Anderson got Albia going at 106 with a pin in 1:07 over Devon Luin. Logan Carter at 113 pinned Sayde Mull in 1:30 and Dawson Bonnett beat Dylan Taylor 4-2 at 120 to tie the meet at 15-15. Albia forfeited 126 and Eli Zanoni was pinned in 2:57 at 132. Michael Thomas won a thriller 10-9 over Drew Bartels of Pleasantville and Barrett Bonnett got a forfeit at 145 to tie the meet again at 27-27. But Stephen Conley lost a 7-3 decision at 152 and Chaz Fee was pinned in 2:22 at 160 before Gavin Shaw beat Isaac Mann 12-8 at 170. Albia gave up a forfeit at 182. Albia team gave up two forfeits worth 12 points and lost to Davis County 40-30. Jer McAninch got the Blue Demons off to a good start with a win over Mitchell Boyd in 3:01 at 220. Logan Hale pinned Albia’s Montez Ellis in 3:50 at 285. Carter Anderson scored a 7-0 decision over Dawson Townsend at 106. Logan Carter lost 14-1 at 113 and Dawson Bonnett lost a squeaker at 120 to Marcus Elam 3-2. Albia gave up a forfeit at 126 (Reeves’ weight class). At 132 Davan Goering pinned Eli Zanoni in 1:53 but Michael Thomas at 138 pinned Simon Ball in 3:19. At 145 Barrett Bonnett pinned Austin Payne in :45. Stephen Conley lost 7-0 at 152, Chaz Fee lost by pin at 160 in :23 and Albia gave up a forfeit at 170. At 285 Montez Ellis pinned Jeff Marlow in 2:50. At 106 Carter Anderson pinned Brody Patterson in 3:35. At 113 Logan Carter won by forfeit. 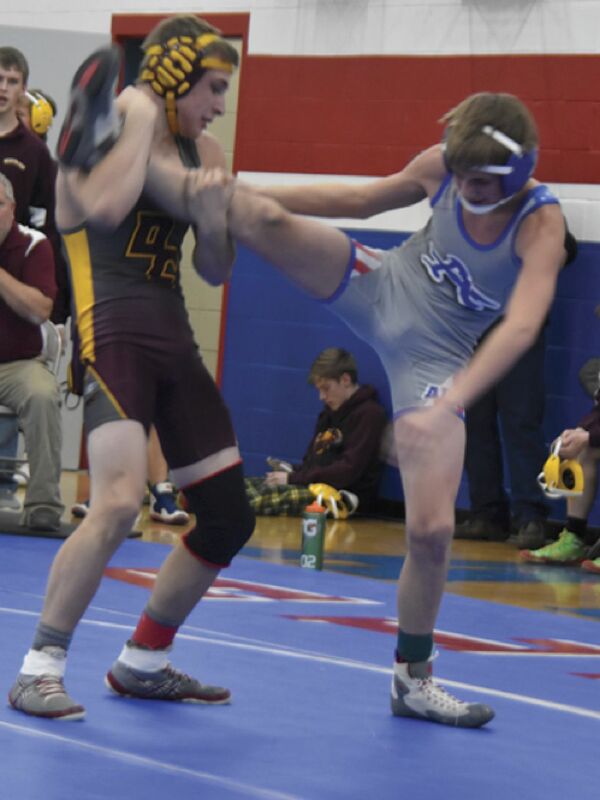 At 120 Dawson Bonnett received a forfeit but Albia gave up a forfeit at 26. At 132, Eli Zanoni pinned Devin Adams in 1:05, at 138 Michael Thomas pinned Colton Barnes in :49 and at 145 Barrett Bonnett won by forfeit. At 152 Stephen Conley pinned Chance Bly in 2:34 before Chaz Fee lost by fall in 3:48 at 160. At 170 Gavin Shaw won by forfeit and at 182, Tegan Carson of Central Decatur won by forfeit. At 195 Doug Flattery won by fall over Lane Moore in 3:49 and at 220 Jer McAninch won by forfeit. The Blue Demons will be at Fairfield this Saturday for their final tournament of the season prior to the sectional tournament at Williamsburg.